With over 100 years of combined experience and track record of successful multi-million dollar awards and settlements, we know what it takes to win your case. 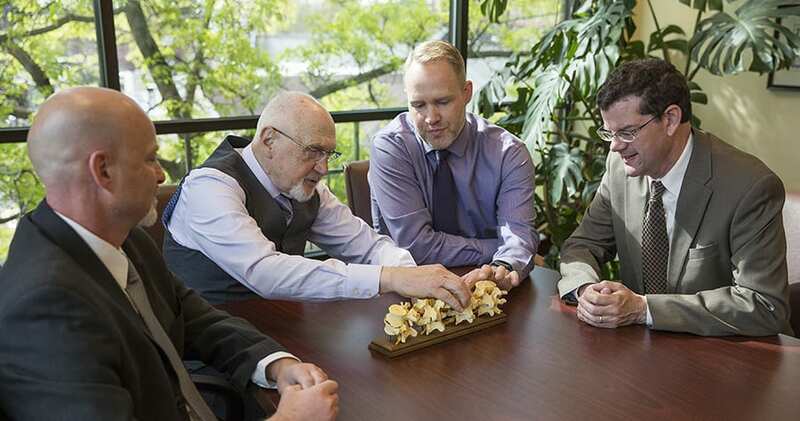 We are a state-wide Oregon injury law firm, with offices in Eugene, Bend, Medford, Grants Pass, Roseburg, & Portland. With a success rate over 98%, our personal injury attorneys have successfully recovered more than 30 million in the last three years for our injured clients in Oregon. With over 100 years of combined experience, experience gets results. As a state-wide injury law firm, with offices in Eugene, Bend, Medford, Grants Pass, Roseburg, & Portland; we are well equipped to navigate you through the complicated legal matters with experience, compassion, and track record of successful multi-million dollar awards and settlements. We have several award-winning attorneys and a powerhouse staff that knows what it takes to win your case. We are Attorneys Who Get Results. At Dwyer Williams Cherkoss Attorneys, we know how a serious injury can leave you and your family financially vulnerable. We believe that cost should never stand in the way of justice. That’s why we never collect a fee for our legal services unless we win your case. As our client, you will not pay anything out of your own pocket or any upfront costs. And, our contingent fee (a portion of the settlement or verdict) will never exceed the amount paid to you. If we are unable to get you the compensation you need, you owe us nothing. That’s our no-fee promise. Motorcycle riders get hurt at an alarming rate in Oregon. If you need a motorcycle accident attorney, we can help. Our auto accident attorneys help car wreck victims fight for maximum compensation after a serious auto accident. We protect the financial future of personal injury victims in Oregon by fighting for maximum compensation in every case! Injured in a Slip, Trip & Fall Accident? Are You the Victim of Sexual Abuse? As an Oregon Personal Injury Lawyer, we believe that individuals and corporations should and must be held accountable for careless and negligent acts that injure or kill innocent people. We see to it that our clients receive fair, just, and full damages for their injuries and losses. If you or a loved one is in need of legal assistance, call Dwyer Williams Cherkoss Attorneys, PC at 541-617-0555 or contact us online. We are an Oregon law practice devoted exclusively to representing the interest of clients who have suffered serious personal injuries or who have been injured in accidents. We leave no stone unturned to get you the settlement you deserve. Our experienced law firm represents those who have been involved in accidents and who are seriously injured with compassion and zeal. We have worked hard to earn our statewide reputation for a thorough investigation, innovative litigation strategies, and aggressive advocacy. We take pride in our reputation because it conveys our commitment to providing the highest quality legal services to our clients. We believe that all persons, organizations, and institutions responsible for inflicting injury on others must be held accountable for the injuries that their actions have caused. We strive to bring justice to those who have been harmed by the negligent or reckless acts of third parties. The other main benefit of our reputation for excellent personal injury advocacy and litigation in Oregon is that insurers across the state know that Dwyer Williams Cherkoss Attorneys, PC are relentless in the pursuit of the best interest of our clients and that we prepare every case as if it will go to trial. This level of preparation allows us to negotiate with insurance companies from a position of strength and it increases our ability to obtain maximal settlements for our clients. The personal injury attorneys at Dwyer Williams Cherkoss Attorneys, PC have 100 years of collective experience representing those who are involved in accidents and have recovered over $30,000,000 for our clients who have suffered serious injuries caused by the negligent or reckless conduct of others. Motor vehicle accidents, slip, trip, and falls, nursing home negligence, dog bites and dog attacks, or brain injuries experienced by a loved one can result in grave personal injuries or even in wrongful death. An enormous amount of stress and anxiety can result from catastrophic injuries. In addition to the physical and emotional trauma experienced by accident victims, catastrophic injuries can rapidly drain whole families of their financial resources. We believe that it is part of our job to make people who have been injured or who are the victims of accidents whole by protecting their families’ financial well-being by restoring their finances to pre-accident and pre-injury levels. If you or a loved one has suffered a serious injury due to the negligence or intentional misconduct of another, we urge you to call Dwyer Williams Cherkoss Attorneys, PC at 1-800-285-8678 or fill out our contact form above for a free case evaluation today. If we agree to handle your accident and injury case, we will work on a contingency fee ("no win no fee") basis. No Win, No Fee. We only get paid for our service if there is a monetary recovery for your personal injury.